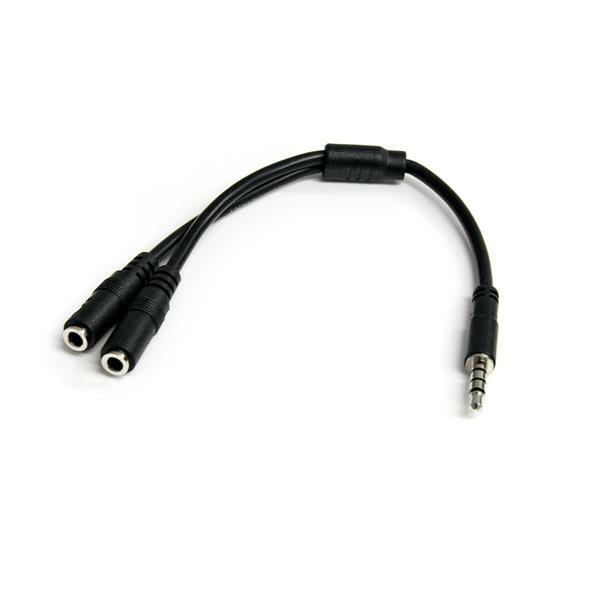 I was having problems with this connecting a microphone. I cut the microphone side cable and only discovered two wires and no shield. Seems to me this is a (1) 4-position to a 2-position and maybe (I haven't cut that side open) a 3-position splitter. We're sorry to hear that you're having difficulties with our MUYHSMFF. 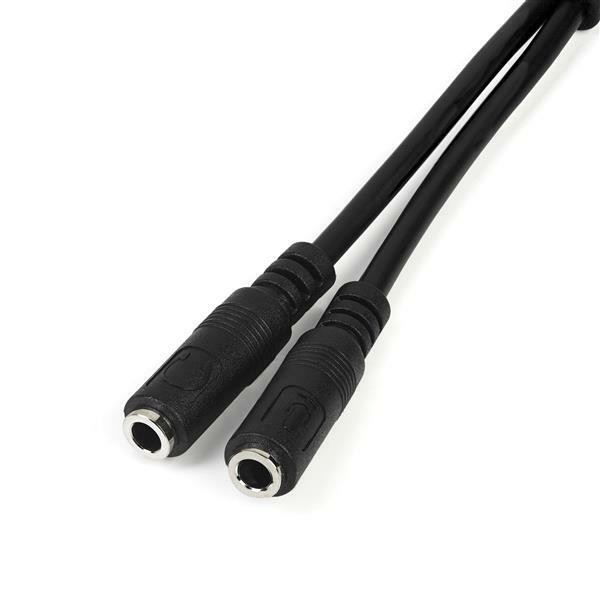 This adapter does have two 3-position connectors, however, the microphone side only needs two wires since the audio output is split to the other 3-position connector. 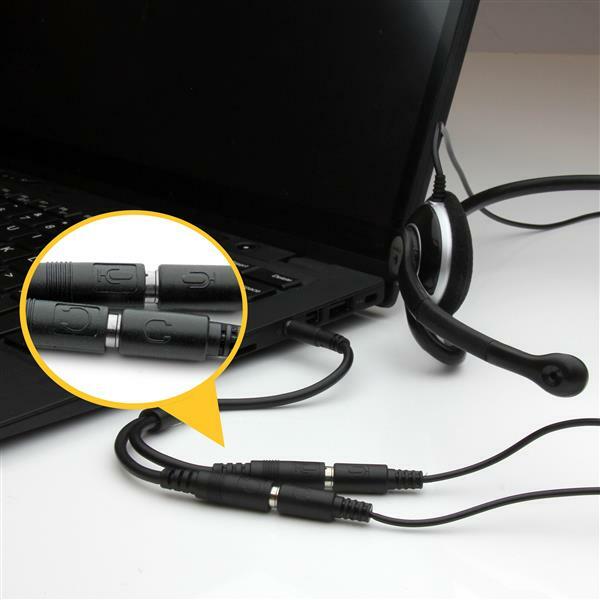 Different 4-position devices may use different wiring standards, which may explain why you weren't able to get your microphone working. Our MUYHSMFF uses the "CTIA" wiring standard. If you ever have problems with a StarTech.com product, please do not hesitate to contact us at 1-800 265-1844. One of our advisors would be happy to help! (4 stars) Worked great, until it didn't. The fact that I was able to obtain the exact splitter I was searching for easily on Amazon from StarTech was GREAT ! Unfortunately, I've had 2 exact items fail in different ways in less than a year. 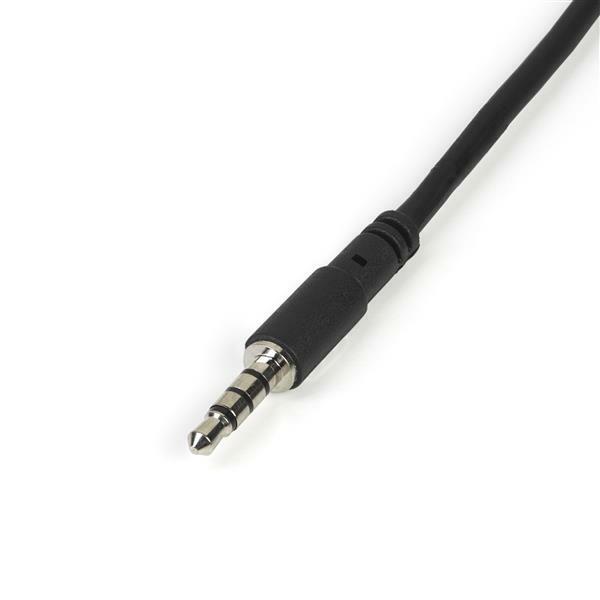 Bought this splitter so I could use an external microphone to record videos on my Galaxy S5. Initially the phone didn't see the mic but after a visit to chat.startech.com and a bit of reconnecting a few times, it saw it and works fine. Appears well built. Why not just say right on websites DOES NOT WORK WITH APPLE PRODUCTS. Rather misleading when you say it works with smartphones rather than informing buyers only works with some smartphones and not iPhones and iPads. Thanks for sharing your feedback on our MUYHSMFF audio adapter. We apologize for the confusion regarding what devices it will work with. We've made a note on our Technical Specifications explaining how our adapter is configured. We also wanted to mention this adapter will work with most newer Apple products but it's important to check how your specific Apple product is configured. I have been using this product for a few weeks. It allows me to connect separate headphones and microphone to my laptop with a single jack for both. I have also tested it on my iPhone and works well for the same purpose. The product comes in a nice little bag and is very small and discrete. The cable is well made, both sturdy and flexible. The connectors fit well and hold cables nicely. The only issue I have is the images one the ends indicating microphone port and headphone port are hard to read. Not a big issue as once you figure it out you are likely to leave everything connected. So far I am happy with this product and will use it regularly. I received this product in exchange for an unbiased review. I bought this for my Logitech G230 headset so I could use it on my Asus Zenbook which only has one audio jack. But it crackles and sometimes stops working or the microphone stops working but the audio is doing fine. This adapter works as it should but sometimes there can be a harsh crackling sound, I assure it isn't my headset as I have tested it on another computer with a split mic and headphone input. Had it for about a month. I bumped the male part and it won't play sound in my left ear AND i can't use my microphone. Seems to be a common issue with the adapters. Had to buy them for each of my boys gaming headsets and they both started experiencing trouble after a couple weeks. Unfortunately, I can't find them available for purchase in any of the electronics stores I've checked. (5 stars) Great product - great service! This is a very useful product for using a cell phone to output calls to capture for broadcast on KNSJ. We have purchased several of them and will be buying more in the future. We purchased 35 of these adapters for our computer lab. Our recently purchased all-in-one computers have combined 4-position sockets for headphone/microphone, but our headsets come with two separate 3-position jacks for headphones/Mic. So we needed these adapters to split the combined input jack. 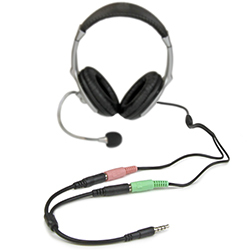 PROS: High-quality build and material; great quality throughput both for Mic and headphones; timely delivery thanks to express delivery option. CONS: Price; we could purchase them at retail store at $7.99; but they could not provide the quantity we wanted in time. So we had to buy directly from Startech at a higher price. Quality is plenty good enough, and I was able to find it on the StarTech site in less time than it would have taken to get the idea across to a RadioHack employee.